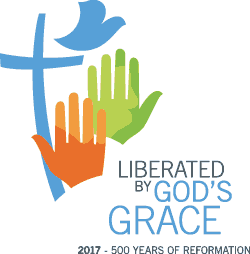 Lutherans are Protestant Christians, who stress that it is through God’s grace that those who profess Jesus Christ as Lord and Savior are brought into right relationship with God. We call that being justified by grace, through faith. This faith empowers us to freely express love to our neighbors—not to win God’s salvation—but in thanks and praise to God who loves us unconditionally and eternally. We are evangelical in the sense that we take seriously our proclaiming of the good news of Christ’s life, death on the cross and resurrection. We are sacramental in that we live our lives together in the communion of the Church, focusing our worship on the Father, Son and Holy Spirit, as we proclaim the Word of God, its law and gospel, in the sacraments. We are diaconal, in that service to the world and care for creation are integral to our identity. We are confessional, confessing that Scripture—the Old and New Testaments—is the only source and norm of our doctrine, life and service, while we accept that the ecumenical creeds and Lutheran Confessions shed light on the Word of God. We are ecumenical, confessing one, holy, catholic and apostolic Church, resolving to promote Christian unity. Lutherans hold, as Martin Luther did, that there are two sacraments: Baptism and Communion. They are part of our evangelical proclamation, expressing God’s love and God’s grace. We administer baptism to both infants and adults, believing that through this sacrament God unites us with Christ, makes us members of his Church, and gives us new life in the Holy Spirit. Lutherans celebrate Holy Communion regularly, believing that the body and blood of Christ are present in the bread and wine for the forgiveness of sins and spiritual nourishment. Lutherans are guided by the historic, ecumenical creeds of the Church—the Apostles’ Creed, the Nicene Creed and the Athanasian Creed—which proclaim that God is a Trinity: Father, Son and Holy Spirit, who creates, saves and sustains us. As Trinitarians, we reject any idea that the Father and the Son are faces of the same person, believing that the Old Testament and New Testament show them to be distinct persons and that the Holy Spirit proceeds from both. The phrase Sola Scriptura or “Scripture Alone” is one of the basic principles of Lutheran theology, part of our Lutheran DNA. The notion developed out of Luther’s challenge of some medieval Church practices, which he argued had little or no biblical basis, such as the selling of indulgences to the faithful. Sola Scriptura does not suggest that Lutherans completely reject tradition; just that Lutheran theology understands that tradition must not contradict Scripture but rather must serve Scripture’s purpose. The primary confession of Lutheran faith s is the Augsburg Confession, which was published in 1530 and written in part by Luther himself. It was the first formal presentation of Lutheranism. The confession was published in The Book of Concord, a collection of theological documents written between 1529 and 1577 to give exposure to Lutheran thinking. In 1529, Luther published both his Small Catechism and Large Catechism to teach the fundamental Christian doctrines. In 1522 Luther’s translation of the New Testament in German was published.